I wandered through and around the unfinished pagoda until late in the afternoon, then remembered that locals had advised me that there was another pagoda nearby that I should see. A short walk away from the ruins of the pagoda was another temple, far more intricate than any I had seen on my trip. Panorama from 4 vertical shots, additional exposures for highlights, focal length 21 mm, aperture f/11, shutter speed 1/6, ISO 64, tripod. The Mya Thein Tan Pagoda is striking — it was truly one of the most beautiful structures I saw in Myanmar. It’s a remarkable pagoda constructed entirely in white, giving it the appearance of a fanciful wedding cake. I learned that the pagoda was built by Bagydaw, the heir of King Bodawpaya, whose enormous ruin sat nearby on the banks of the river. But Bodawpaya’s great, unfinished pagoda was a monument to pride; Bagydaw’s temple had a more noble inspiration. Construction on the pagoda began in 1816, shortly after the death of Bagydaw’s first wife in childbirth. The temple was a memorial to his young wife and a way for him to show his devotion to her, even in death. To fund the construction of the pagoda — which is so intricately detailed that it can be fully appreciated only by seeing it in person — the king used 100,000 emeralds. 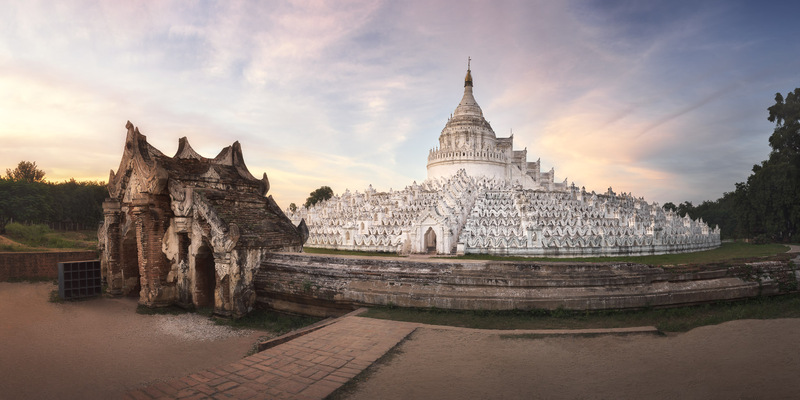 It’s from this fact that the pagoda takes its name — Mya (emeralds) Thein Tan (100,000). Beyond its remarkable detailing, the pagoda is also noteworthy for the seven terraces which lead to the central round stupa. The terraces, it’s believed, are meant to be a tangible representation of Mount Meru, the sacred mountain that is believed to be at the center of the Buddhist cosmos. The seven terraces represent the seven peaks that rise up to Mount Meru, which is represented by the dome at the top. Myanmar was a dream of mine for a long time before I finally got to go, and I planned the trip carefully, so that I had the best chances for good weather. I gave myself a window of time in between the rainy season and the clean cloudless skies of winter. I was never more grateful for that planning than on this day, as I photographed the Mya Thein Tan Pagoda. The brilliant white of that remarkable structure was particularly stunning against the pink sky of a coming sunset. On my way back to Mandalay I was thinking of two very different men — one who built for pride and another who built for love. This entry was posted in City and tagged Mingun, Myanmar.